The third time may be the charm for Cecilia Liu (劉詩詩) and Wallace Huo (霍建華), who began filming for the period drama, The Imperial Doctress <女醫•明妃傳>, on March 25. The Imperial Doctress marks the third time the two have collaborated for a drama produced by Chinese Entertainment Shanghai. Set in the Ming Dynasty, The Imperial Doctress tells of how a young woman named Tan Yunxian (Cecilia Liu) succeeds in becoming a doctor during an era when females were considered of low status and barred from studying medicine. For generations, her family served as court physicians, but the tradition came to a halt after they were framed by a crafty scoundrel. However, Yunxian secretly learned the science of Chinese medicine from her grandmother and went on to become one of the most beloved doctors of her time. 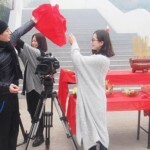 Because The Imperial Doctress is focused on medicine, the production crew invited Chinese medicine specialists, as well as historical experts, to assist them on set. Cecilia and Wallace both revealed that working on this drama helped them learn more about maintaining their health and nourishing their skin. Cecilia even shared that the first thing she did after joining the set was to purchase honey and an air purifier, in order to improve her skin tone. Due to working together on Chinese Paladin 3 <仙劍奇俠傳3> and Vigilantes in Masks <怪俠一枝梅>, Cecilia and Wallace are close friends, which helped them adapt quickly to the filming of The Imperial Doctress. However, Wallace was careful not to get too close; after being asked to give Cecilia a tender-hearted hug, he blurted out an apology to Nicky Wu (吳奇隆), Cecilia’s boyfriend. The Imperial Doctress will be co-produced by Chinese Entertainment Shanghai and New Classics Media. 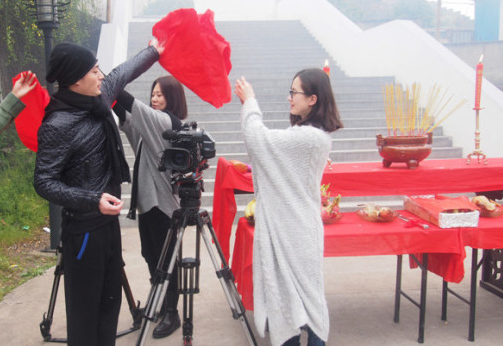 This is the first time that Chinese Entertainment Shanghai, best known for Bu Bu Jing Xin <步步驚心> and the 2008 adaptation of Legend of the Condor Heroes <射鵰英雄傳>, has produced a television series with another company. Though not as well known, New Classics Media was behind dramas such as Beijing Love Story <北京愛情故事> and Hot Mom <辣媽正傳>, as well as the movies Caught in the Web <搜索> and Love is Not Blind <失戀33天>. Cecilia Liu’s acting is terrible and boring…..
she always seem to have the same facial expression in all her dramas. i couldnt finish BBJQ because of her…. She’s average in looks and acting. Looking forward to this too! I think this is the 4th time the collaborated. Remember Wallace has a cameo in new crappy looking series produce by mr. Wu. I enjoyed jeweled in the palace, I just hope that this will be a bit more fast pace. And I hope the love relationship isn’t as slow either. are you serious? please no. omg chinese remake of Korean dramas are always bad. I love Dae Jang Geum. This is going to ruin it for me. Maybe this “remake” will be better since I personally did not enjoy Dae Jang Geum. I didn’t like Dae Jang Geum. My mum watched it and I saw a few episodes and thought it was boring and draggy. oh gawd. no. no remakes. You and I have the same taste Puff. My mom and I did not enjoy Dae Jang Geum at all and thought it was boring and draggy. We do not get why it is so popular. I hope this version will be different and better. Can’t wait for this series! I love them together! Unless I’m mistaken, this is based on a Chinese story of an actual Ming Dynasty doctor and NOT a Chinese remake of Dae Jang Geum. Seems like Chinese culture is now unfairly accused of plagiarizing Korea when historically China was the great cultural influence to neighboring countries in ancient times.